So I do a lot of non-drafting type drawing, which I will admit is most of drawing. But in that type of drawing, lines are not the same length, they waver, get thicker and thinner and such. 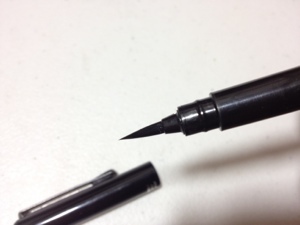 If you need to get a similar effect, Pentel has a pen for you. The Pentel Pocket Brush Pen is quite a nice instrument with a very uninspired name (which is good for tracking it down). 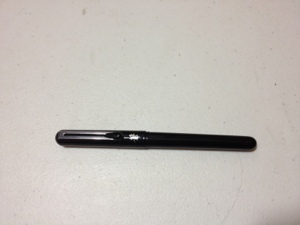 The body of the pen is medium length, slick and black. At the bottom of the cap in silver is an asian character that I don’t know the origin of and the word Pentel. They are both slightly engraved and hinder nothing. They are the only adornments on the pen. There is also a clip on the pen that serves its purpose well. The brush itself is very nice, it is easy to keep at a point and is very responsive to pressure. The pen requires no squeezing or other methods to keep ink flowing so one always gets a nice full line. The ink itself is black but thin. It takes multiple coats to create a true black, otherwise one gets streaks, but these are only visible on close inspection and may be what you’re going for. The cartridges are also replaceable and fairly easy to find. The pen comes with two and one can buy packs of four. In short the Pentel Pocket Brush Pen is just that, a pocket brush pen, and a very nice one at that. It does its job well and painlessly. It is one of the finer and cheaper brush pens I have encountered. This entry was posted in Advanced Supplies, Utensils and tagged black, brush, brush pen, ink, inking, pen, pentel, pocket, simple by Dragon Co (Austin Smith). Bookmark the permalink.